1. Eat French Food- One of the best ways to connect with the French culture is by sampling their delicious food. Crepes are a French food that can be eating for breakfast, lunch, dinner, or dessert, depending on what they are filled with. They are much like a thin pancake and can be filled with anything from eggs to chocolate. Other popular and delicious French foods are Foie Gras, Brie Cheese, Cassoulet, and of course their assortment of delicious French breads. 2. Watch French Movies- French movies are a great way to connect with the French culture in a stimulating way. There are many classic French films that would still provide great entertainment today. Some examples of great French movies are Amélie, Breathless, The 400 Blows, Jules and Jim, The City of Lost Children, La Haine, and many more great films that would connect you to French culture. 3. Learn to Speak French- An important part of French culture is obviously their language. It is said to be one of the languages of love and is beautiful when it comes off the tongue. If you are still in school it would benefit you to take advantage of any classes that your school offers pertaining to France, and specifically the French language. If you are not in school there is still the option of French classes at a local community college. There are also many "teach yourself at home" options, which are normally on tape. This option would appeal to those with heavy schedules and little free time. 4. Read French Novels- After learning the French language, you may be looking for a way to put your new-found knowledge to good use. Reading a French novel is the perfect outlet for this new skill of yours. Some popular French novels are The Count of Monte Cristo, The Little Prince, Madame Bovary, The Stranger, The Hunchback of Notre Dame, and many more titles. 5. Research French History- It has been said that One cannot have a future without understanding their past. The French have a rich and interesting history that is still present in France today. It would benefit anyone who is interested in France to verse themselves in French history. One particular form of French history that is still a large part of present-day France is their art. 6. Plan Your Dream Trip To France- If you are interested in enjoying France without being there physically, it is likely that you aspire to visit the beautiful country someday. A way to follow that dream is to start planning your dream French vacation now. Even if you are not at a place in your life where it would make sense to take a trip to France, it would still give you the opportunity to research French attractions that you would like to take part in when you can actually make it to France. 7. Hang a Picture of the Eiffel Tower In Your Home- The Eiffel Tower is probably the most iconic representation of the country of France. Having an image of this incredibly famous landmark in your home can give you a little slice of France from the comfort of your own home. Author Jason Harter enjoys traveling and blogging. He is a contributing writer for travelinsurance.org. I need to practice my French more, maybe take another class. Great tips! Vive la France! 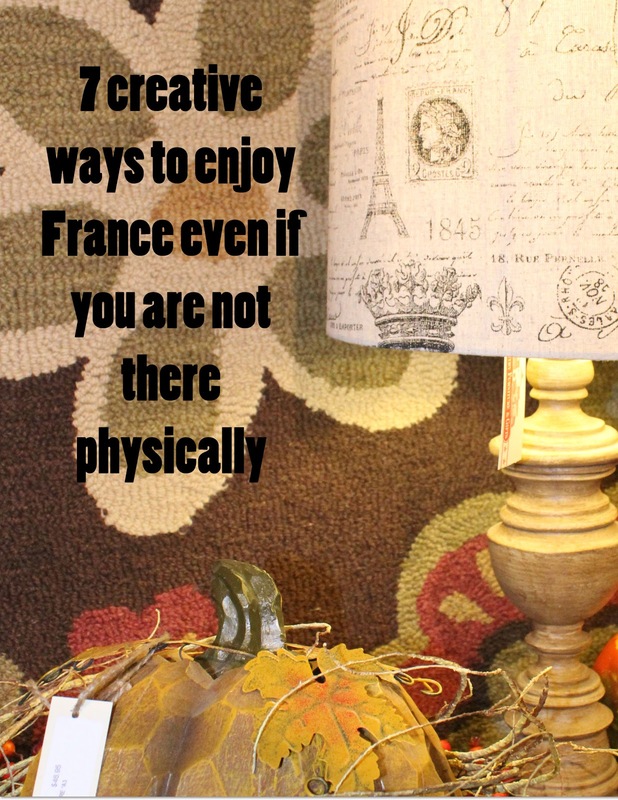 I love your ideas for enjoying France even when you are not there! Do you have any recommendations for some kids movies in French? Lynette you can get most movies in French, CD's have a French version. Just look at your menu selection. Aladdin is pretty fun in French.